Catamarans are multi-hulled boats and are considered as luxury cruising yachts. Catamarans were used for racing or sports purposes, however, over the past few years, these have been manufactured for cruising as well. Along with sports and cruising, catamarans are also used for various other applications such as passenger transport and military operations. Catamarans offer multiple advantages such as enhanced stability, speed, and maneuverability over other marine alternatives such as boats, yachts, and monohulls. This has led to high adoption of catamarans for various applications including sports and recreational purposes. The average speed of catamarans is 300 nautical miles (560 km) per day, which can be as much as 400 nautical miles for sporting events. Catamarans provide ample space, improved stability, due to support from two hulls, high speed, level sailing due to lack of heeling, and safety. This are among the major benefits that has in turn, led to growth of the market over the forecast period (2018–2023). 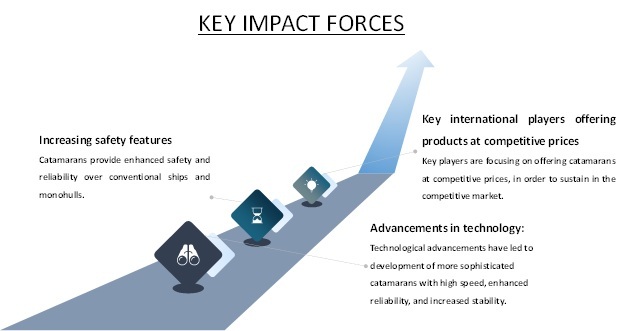 Technological advancements in cruises such as enhanced speed and safety features coupled with increased stability have led to increased adoption of catamarans for various application. It is increasingly being used for luxury and leisure application, however, it is also gaining popularity in military operations and transportation as well. Advancements in terms of reliability and enhanced speed and stability such as powerful engines and durable body of the hulls has aided catamarans to scale large distance in shorter time periods and offer enhanced comfort and safety. The racing events are gaining traction and are demanding advanced features in catamarans for enhanced speed and durability along with space and luxury features. Catamaran or multihulls are popular for cruising, relaxing, and has features to provide maximum comfort, see over cabin tops, wide space, and bridge deck clearance and several other performance based advantages in relation to power and speed catamaran. Cruising catamarans such as Cat 38 offered by Maine Cat Catamaran, Saona 47 offered by Fountaine Pajot, and HH-55 offered by HH catamarans are all high performance, comfortable, and easy-to-handle cruising catamarans. Also, events such as World Cruising Events organized by Atlantic Rally, is also another factor expected to aid in growth of the market over the forecast period. Catamarans offer enhanced speed, however, reduces load per unit of cost. Along with speed, catamarans draw much less water than monohulls, which is as less as 3 feet. This allows avoidance of shoals and ease beaching the boat to work on the bottom. However, the added beam of a catamaran may cause problems for docking or hauling out by a boatyard. Moreover, catamarans have added expense for having two engines and two rudders, which is are factors negatively affecting growth of the market. Catamaran are especially popular for sports in North America, Europe, and certain parts of Asia Pacific region such as Australia. A variety of sailing catamarans and foiling catamarans have been used in Olympic sailing competitions. North America was the dominant region in the global catamaran market, and is expected to retain its dominance over the forecast period. According to Coherent Market Insights’ analysis, North America is expected to exhibit a CAGR of 4.2% to reach US$ 557.8 Mn by 2023 from US$ 417.4 million in 2016. Key players in the market are focusing on launching new products, in order to enhance its market share. For instance, Aquila 36 is an outboard powered sport catamaran offered by Multihull Central, which was launched in 2017. Some of the key players in the global catamaran market include Sunreef Yachts, Spirited Designs, Lagoon Catamaran, Fountaine Pajot, Matrix Yachts, Voyage Yachts, TomCat Boats, Robertson and Caine, and Gemini Catamarans. *Browse 60 market data tables and 40 figures on "Catamaran Market - Global forecast to 2023”.